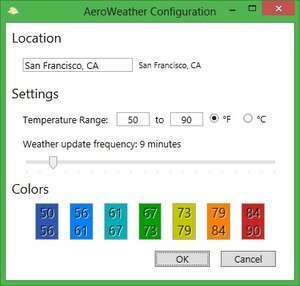 AeroWeather is a fun utility that sits in the background and retrieves the temperature or current conditions for your location, and will then set the Windows Aero color based on the temperature. This is a really neat utility if you’re the kind of person that wants to know what the temperature is just by looking at the Windows UI, or you can’t decide on which Aero color to use, and would prefer it if it changed during the course of the day. For security reasons, you should also check out the AeroWeather download at LO4D.com which includes virus and malware tests. Additional screenshots of this application download may be available, too.